Card Effect(s) [AUTO](VC/RC):When this unit's attack hits a vanguard, choose up to one card from your opponent's bind zone, and put it into the drop zone. The reason people stopped using Kuroko in Nubatama. 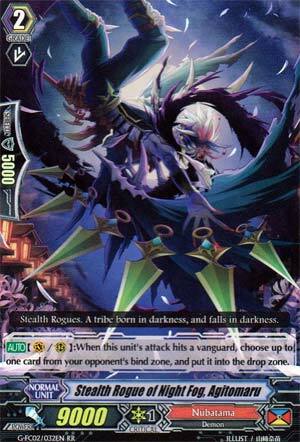 This nasty card, upon hitting the Vanguard, sends one of the opponent's bound cards to the drop zone. Doesn't come much simpler than that. So any turn you can bind, this is pretty great when used in conjunction with more on-hit pressure like Dreadmaster to quickly assassinate hand. It's a good first ride if you have Tamahagane, and just continues to create good situations for you no matter the deck. Staple for Nubatama. Not much to talk about here. Why do you not have this in your Nubatama deck already?